The disappearance of Saudi writer Jamal Khashoggi from Istanbul after visiting the Saudi consulate there on Oct. 2 is disturbing but not surprising to me and other dissident writers and activists who provide a critical view of the kingdom and have paid for it, usually with exile or prosecution of our family members. As a Saudi citizen exiled in Washington, D.C., since 2000, I have seen and experienced first-hand what the government is willing to do to silence its critics inside and outside the country. These actions date back to as early as 1979, when dissident activist and author Naser Al Saeed was abducted from Beirut, Lebanon, in December of that year. Opposing the Saudi royal family — especially if you advocate a progressive alternative to the current regime — is a dangerous undertaking, a fact that has never been far from my mind since moving to Washington, D.C., in 2000 after my graduate studies in Minneapolis. Once I became a recognized voice for reform and democracy, the Saudi government used carrots and sticks to silence me. In March 2004, the Saudi Embassy seized my passport when I attempted to renew it and offered me a one-way ticket home. The government has since quietly made me a stateless person by rescinding my nationality, which I discovered only when my family tried to process a legal document back home. The monarchy has also been trying to convince me to return home since 2002. In 2007, a senior Saudi intelligence officer traveled to Washington to arrange a meeting between former Saudi crown and then head of Saudi intelligence (and brother of the present King), Prince Muqrin bin Abdulaziz, and myself at the Ritz Carlton Hotel in Tyson’s Corner. The government also used Arab nationals to lure me to Malaysia and Lebanon, countries known for handing dissidents over to the Saudi government. I had the good sense to decline these invitations and made the U.S. government aware of them. 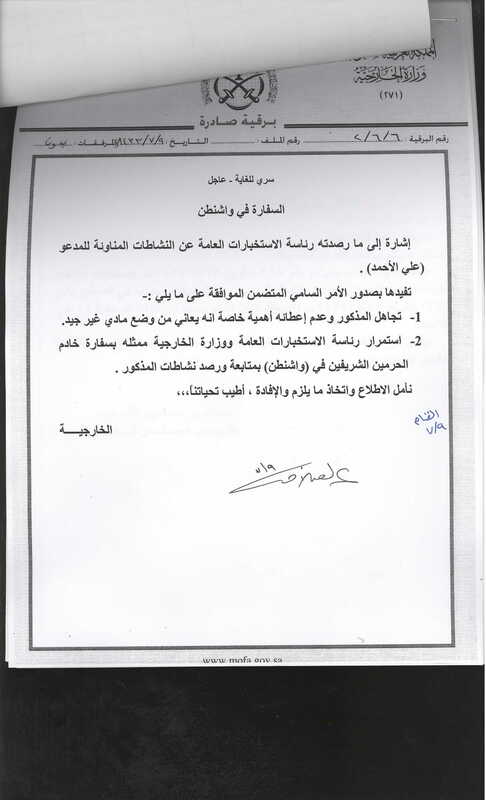 A WikiLeaks document sent in 2013 from the Saudi Ministry of Foreign Affairs to its embassy in Washington (at the time led by the current Foreign Minister Adel Al-Jubair) ordered the surveillance of the Institute for Gulf Affairs, an independent think tank that I founded in 2001. What’s more, the document accurately noted that the IGA was going through financial challenges — a detail that was known only to me and my staff and which we later learned was leaked to the government by a Saudi national who worked with us for a time and later joined the government. In recent months, I have received many phishing emails designed to hack into my account. One of them was particularly disturbing because it illustrated how far the government is prepared to go to silence its critics in Washington. The email included a photo of me attending a public event at the American Enterprise Institute, which could only mean that a government agent reported my presence, extracting my image from a video and sending it to me in a phishing email. This past June, the head of The Saudi American Public Relation Affairs Committee, Salman Al Ansari, called me a terrorist after I reported on his links to antisemitism. I responded with a lawsuit, currently being tried in D.C. Superior Court. I’ve received dozens of death threats, some of them serious. In one case, a young Saudi man told me he would come to Washington to kill me after I tweeted that Crown Prince Mohamed bin Salman was “feeble-minded” for paying $200 billion to build a mega solar project that would supplant China as the world’s leading supplier of solar panels. I gave that information to the U.S. Embassy in Riyadh, and thankfully they denied him a visa. The government also tries to coerce me by squeezing my family, a common Saudi tactic. Two of my brothers were arrested, and one of them has been in prison for over 20 years just for being my brother. My nephews were also arrested; one of them has been sentenced to eight years in prison for attending one protest. My family — parents, siblings, nephews, cousins, and many relatives and friends — is no stranger to political persecution. Two of my cousins were killed during the 1979 uprising, the first Arab popular uprising. I myself was imprisoned at age 14 and avoided capture narrowly on several occasions by fleeing the country. My story is not unique; the Saudi government routinely persecutes other dissidents. Last month, prominent social media star and satirist Ghanem Al Dosary (our own Jon Stewart) was assaulted by several Saudi nationals in front of Harrods, a famed London department store. This attack in broad daylight was captured on video, yet none of the assailants have been arrested and the British government has yet to provide an explanation for its inaction. A few weeks ago, a young man in West Virginia contacted me through a mutual friend to seek help with his asylum application. This individual, Mr. Hamad AlSudairi, had been stabbed by a Saudi national after hearing him criticize corruption in Saudi Arabia. Such mild condemnation is sufficient cause for a pro-regime zealot to attempt murder. The case is now before a West Virginia court. The forced disappearance of Jamal Khashoggi by the government of Saudi Arabia is an attempt to intimidate other dissidents into silence and/or surrender. Unfortunately for the Saudi regime, history teaches us that despots can never succeed in completely suppressing the voices of freedom. Speaking for myself, I can say that I have inherited that spirit of dissent in order to fully empower our people and to establish a modern government with full rights for all. This dream will never die, no matter what the cost. We only have one life, and we must make it worthwhile. Ali Al Ahmed is the founder and President of the Institute for Gulf Affairs.